Things weren't too pleasant in the palace yet after Wook receive the punishment and 14th Prince Jung Showed up with the doctrine to marry Hae Soo. Queen Yeon Hwa went to meet her brother Wook and again beg her to help her maintain her position as the Queen. As she knew she won't stay as the Queen of Goreyo without Wook's help. No doubt Wook had a mind sharper then the knife. Listening to Yeon Hwa request and knowing about Jung demanding marriage with Hae Soo he had nothing left to lose. So he decided to give his last to help things back to their original place he decided on something and came to meet the king. He promised to tell him the truth about his personal life before leaving the palace. It was regarding the intimate relationship with Hae Soo which starts before Prince Wang So came to the palace.Hearing this angered King and he crushed his teeth saying Wook must have wished to die. As he has to be feared and lose now he continued his talk. He told King Wang So it happened long before Hae Soo become King's women before that she was one of his persons and they both decided to get married. But things didn't went well and they had to delay their marriage for some reasons. It was really unbelievable for the king to hear the love story of his women from two of his little brothers who also claim that they own Hae Soo and she belongs to them. King Wang So life and mind was messed up he couldn't understand as he don't want to gave up on Hae Soo and thought both were lying so he came to confirm all with Hae Soo. He couldn't believe when Hae Soo told him that its the truth. He then ask ask Hae Soo was it wook the person she was in love with and the bracelet she use to cherish and wore for a long time was from Wook. 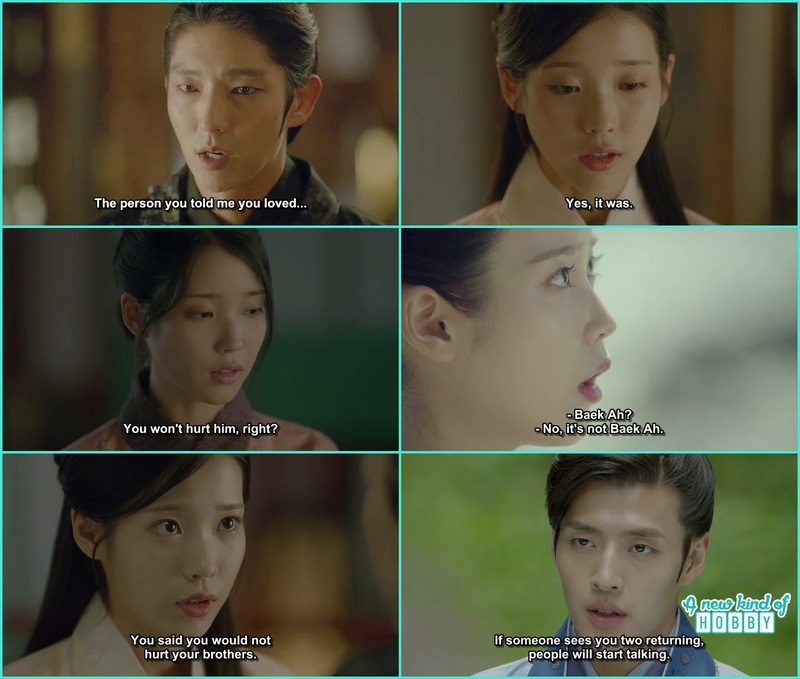 Hae Soo accept all this as the truth of her life. 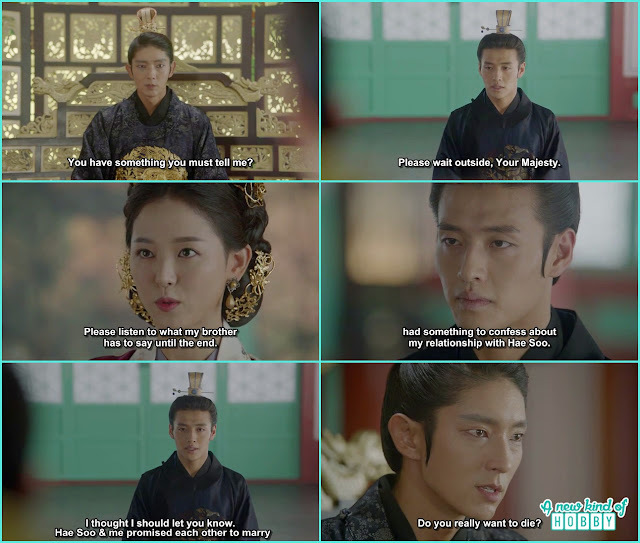 Still the king don't want to believe but Hae Soo remind him that they both promised each other not to lie about anything. King So was desperate to make sure Hae Soo say its all a lie but how can the truth be the lie. This time the truth become the more of cruel then anything else and give pain to the king. As King didn't have any good relation with Wook and he don't like to see Wook so this truth hurt him a lot. He shout in pain why it was Wook of all people. 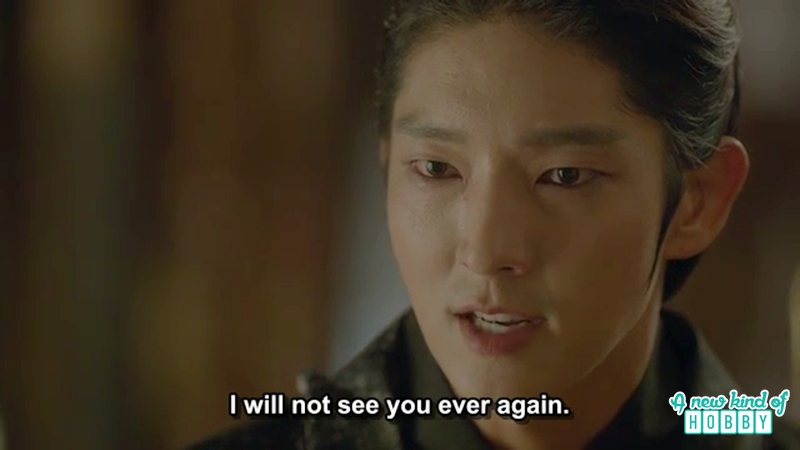 Hae Soo wanted to calm and comfort the king but the anger and the ego came in between and King refuse saying he don't want her to touch him and it will be the last day he will be seeing her from now on he won't have any reasons to see her. In other words King Wang So after hearing all the bitter truth gave Hae Soo permission to leave the palace and threw her out of her life. May be its good for others that Hae Soo would leave the palace.